The third part of Pope’s Francis address focused on “Doing good led by the good spirit, thinking with the Church” and contains a special attention to “discernment”. Discernment is a path by which one tries to discover how the Spirit is working, how God is acting, how Love becomes incarnate in our life and in the world. By this process a person or a group subtly discerns the different motions and motivations that move us in our concrete actions and lead us to act to the greater joy of God. 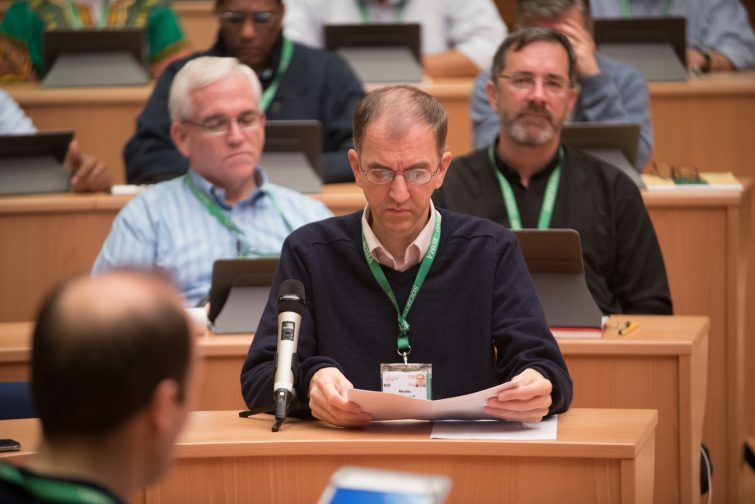 The message of Pope Francis encourages Jesuits to reflect on how to more effectively make use of this path in our ways of operating. In addition his address indicates that Ignatian discernment is a gift of the whole Ignatian family to the Church and society. How can we put this invitation into concrete action? As a concrete example, I take my inspiration from the theme for the next Synod of Bishops 2018 that was announced during the first week of the General Congregation in early October. The title is “Youth, faith and vocational discernment” and the official text describes that “its aim is to accompany the young on their existential journey to maturity so that, through a process of discernment, they discover their plan for life and realise it with joy, opening up to the encounter with God and with human beings, and actively participating in the edification of the Church and of society”. In a nutshell, this description corresponds to several aspects of Pope Francis’ address to the Jesuits: the fact that not only young people but that we are all on a journey, that we are all called to discover a plan for life and are invited to realise it with joy, that this discovery happens through a process of discernment, that in our human encounters we can experience a glimpse of God’s Love, and that we are challenged to give a concrete expression of this Love in building Christian communities and a more compassionate society at large. To accompany young people on their journey through discernment appears as a renewed mission of “doing good led by the good spirit, thinking with the Church” for the Society of Jesus and the Ignatian family. Not only is there the long tradition of work in education, but the presence of so many young people all over the world makes the call even more appealing. Certainly there will be real challenges: e.g. how can we translate the rules of discernment in a language that is accessible to the young men and women of today, taking into account the diverse cultures? To answer these questions we need both the local embedding and the universal sharing of our good practices. More is required: to “accompany” is not a one-way direction but requires reciprocity. Pope Francis insisted that we also “’listen to young people”. By doing so we can discern with them on our common journey.